﻿To stay up to date, please follow us on Facebook and subscribe to our email list! We hold dances about once a month, typically on second Fridays from 8pm-11pm (with a break around 9:30pm). Please refer to the calendar on our home page for a list of our upcoming dances. The Claremont Colleges include a number of beautiful dance venues, including Balch Auditorium on the campus of Scripps College, and Edmunds Ballroom and Bridges Hall of Music on the campus of Pomona College. We rotate between them; please refer to the calendar on our home page to see where our next dance will be. Free visitor parking is available throughout the Claremont Colleges; please refer to this map. If you are looking for a ride, please let us know and we may be able to help. Most of our venues are about a 20-minute walk from the Claremont train station. Our dances typically attract around 50 people throughout the course of the evening, around a third of whom are community members. Many students are beginners, so experienced dancers are encouraged to come! Everyone is welcome! We do not have a specific time block for lessons before our dances, but our callers teach starting from a beginner level. You do not need any prior experience to come! We typically bring in professional callers and bands from the greater Los Angeles area or use student bands. If you are interested in calling or playing for us, please let us know! We offer free refreshments from Trader Joe's during our breaks. Most of our venues have a water fountain nearby. 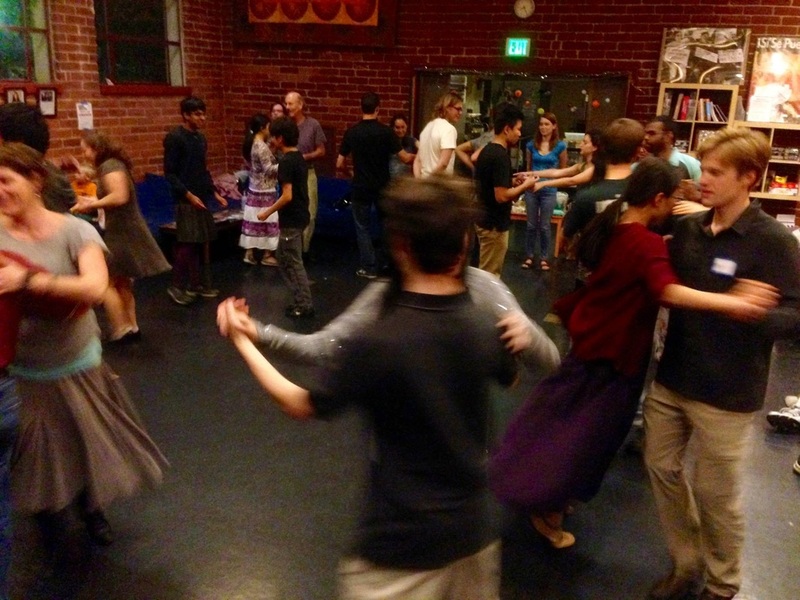 Our April 2015 dance at the Motley Coffeehouse (Scripps College). Photo by Bette Hostetler.